How to Improve Your Investing With Lessons From "The Big Short"
Investors can get more than entertainment from this blockbuster hit. After pulling in over $130 million in theatrical revenue and five Academy Award nominations, and bringing home an Oscar for "Best Adapted Screenplay," it's clear that The Big Short resonated with the masses and critics alike. I hope it also resonated with you as an investor. Beyond entertainment, there are investing lessons in the movie from start to finish. Here are a few of my favorites to help improve your investing today. At one point in the movie, Christian Bale's character, Michael Burry, is shown digging through a spreadsheet with all the underwriting details of the specific mortgages making up a mortgage-backed security. He was doing his own homework, an effort that would eventually bring him a personal gain of more than $100 million. While a credit rating agency may have rated this security with the highest investment grade, Burry didn't accept that assessment at face value. Instead he studied the documentation and specific details of each security. From that homework, he was able to deduce that mortgages with teaser rates -- initially low interest rates that would reset to higher rates in the future -- were particularly risky and likely to default. When the rates reset, sometimes as quickly as two years after the loans were first made, these particular loans defaulted more often than not. With this knowledge, he convinced Goldman Sachs to sell him credit default swaps that would profit if those loans defaulted. When they ultimately did, Burry profited by $100 million personally and produced a $700 million gain for his investors. The lesson for investors of all walks is that the devil is in the details. The best investors don't blindly accept what others are selling. They do their own homework verifying analyses, studying the market, and drawing their own conclusions. The source of an investing idea can come from anywhere, but these elite investors don't buy or sell without doing their own due diligence first. That attitude is the only reason Burry was so successful in uncovering and profiting from the mortgage crisis. Goldman provides its own lesson in doing proper homework, albeit for more nefarious actions than what we learned from Burry's detailed analysis. Goldman was fined $550 million for selling particularly risky mortgage-backed securities to investors that Paulson & Co. was simultaneously shorting. The catch was that Goldman bankers allowed Paulson to select the exact securities to be sold, cherry-picking the riskiest and most likely to default. While it doesn't excuse the fraud by any means, had those investors actually looked at the details, they might have avoided the losses and spoiled the fraud. All of the investors that hit it big in The Big Short successfully did two things: correctly analyzed the mortgage and real estate market, and correctly timed the downturn. The difficulty in consistently succeeding on the second point should not be understated. Michael Burry is again a great example. He correctly identified the real estate bubble as early as 2004 or 2005, but before the bubble actually burst, his fund nearly went belly up as investors withdrew their money from his fund. The real-life Burry attempted to explain his logic to his investors, an interaction the movie mostly glossed over, and he was met with strong resistance. His investors either flatly rejected his thesis, did not want his fund to deviate from the strategy they initially signed up for, or thought they could do it themselves. The movie does demonstrate how trade ideas work through the insular world of Wall Street, as news of Burry's actions makes its way to all of the movie's main characters. For Burry and his investors that stuck around, the payday was monumental. However, had the housing bubble lasted another year or two before bursting, the outcome could have been much different. 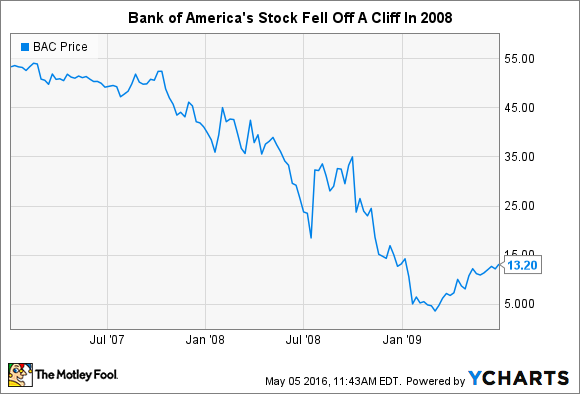 For example, Bank of America (NYSE:BAC) was on the other side of the equation in January of 2008 when it acquired the mortgage company Countrywide Financial for $2.5 billion. Less than a year later the real estate bubble burst, Countrywide's massive subprime mortgage portfolio imploded, and the bank's stock was well on its way to a 90% decline. It's estimated that the Countrywide acquisition cost Bank of America over $50 billion before the crisis was over, 20 times what the bank paid to acquire it. In total, the financial crisis generated over $195 billion in extra costs and losses for the bank between 2008 and 2015. In both cases, timing was everything. However, that's not the lesson. The lesson is that it's way too difficult and risky to try and time the market. Time is only your friend over the long term. Bank of America and Michael Burry bet the house on the mortgage market. One got it right. The other got it wrong. And even Burry, who was successful in the end, nearly lost his entire fund in the process. Are you willing to accept that kind of risk for your nest egg? In 2007, did you honestly think that the S&P 500 was on the verge of dropping over 50%? Or at the deepest point in the recession in the middle of 2009, did you truly think the market was about to jump 70% higher? Or more recently, what were your honest thoughts and feelings last August or this January, when the market was gyrating so wildly on fears of a Chinese slowdown? Did you see these events coming, or were you caught off guard with the rest of us? The truth is that no one predicted or timed all of these events correctly. Not me. Not you. Not anyone else. It's impossible to time the market every time. It's a futile effort, and I don't think you should bother attempting it. Instead, invest steadily over time and let the long term be your ally. Some investments will come when the market is down and others will come when the market is up. Over time the peaks and valleys will smooth themselves out, and your portfolio will steadily chart from the lower left to the upper right. A central component of the mortgage crisis -- in The Big Short and in real life -- was subprime mortgages. These loans to less credit-worthy borrowers helped to fuel the bubble and ultimately brought down the house of cards. How did these risky loans become so prevalent? Banks came up with a business model that was too good to be true, and in the end, it was. Borrowers with lower credit scores have higher default rates on their loans than borrowers with better credit. That's as true today as it was before and during the crisis. However, in the boom years leading up to the crisis, banks were able to make up for those higher default rates by charging much higher interest rates to borrowers with low credit scores. It wasn't until the bubble burst that these weak underwriting practices inflicted major damage, quickly overcoming the higher interest income with loan losses, foreclosures, and defaults. The real estate boom hid just how much extra risk the banks were taking on. The business model was too good to be true. Low-documentation mortgages are another example. Before the crisis, statistical models showed that low- or no-documentation loans performed just as well as mortgages with full income and asset verification. Banks concluded that these underwriting steps were therefore unnecessarily burdensome for borrowers, and that eliminating them could increase sales without increasing risk. The banks were correct that it would increase sales. It's clear in hindsight that they were very wrong in their assessment of risk. As investors, we must always remain vigilant against investments that promise more than they can possibly deliver. If a stock offers a dividend yield of 15%, there must be some reason why the yield is so much higher than the rest of the market. If an investment advisor offers a complex strategy to double your returns this year without any extra risk, you should be skeptical. If a mutual fund has returned exactly 7.5% for the past 15 years straight, you may want to take a deeper look into what they're actually doing. If something seems too good to be true, trust your gut.